This year’s post will not be as hard hitting as last year’s since the last 12 months have been about continuity and growth for me and my business. No radical changes in my themes toolset in the last year as my main framework has remained the same : iThemes Builder. It continues to deliver for me and I learn to appreciate it more and more as I work on more projects with it. But I took the time to experiment with others frameworks because I did not want to be in the same dead end situation I found myself in 18 months ago when my previous framework stopped meeting my projects’ growing needs and I wanted to find an alternative I could use quickly if for some reason Builder stopped delivering up to my expectations. So now I also use a second theme on certain projects: WooThemes Canvas. More on that later in the post. If I’d been busy in 2011, then in 2012, things just got crazy. That is great news for any business but it adds pressure on me to streamline my workflow and consistently deliver Web sites to my clients that are stable and efficient. I’ve worked very hard on optimizing my business in the last year by taking both large and small steps to improve it. The biggest change I made was to officially partner with a graphic designer I’ve known for over 20 years. I worked with her in my old job in the screen printing industry and have always admired her creativity, talent and business mindset. We learned the ropes of business in the same company after all. That means that for most of my recent projects, I could concentrate completely on the client relationship, the project’s strategy then on the WordPress development side leaving graphic design almost completely in her hands. As much as I love to design, I know that it’s not my main strength and my clients are better served this way. So, in spite of my increased projects load, this has enabled me to work at a less crazy pace in the last few months and improve the way I work with my theme frameworks. As the number of existing WordPress Web sites I maintain is also growing, ease of update is more important than ever for me and that means sometimes being able to update not just the parent, but child themes as well. iThemes Builder remains the best framework I’ve ever used in that respect. No update of the parent Builder theme has ever broken a client site layout. Not once, ever. That to me is priceless and goes directly to trust. If a theme fails me and breaks on a site either after a minor update or just like that for no apparent reason as Headway has done for me numerous times before, it’s my own reputation on the line. My clients do not care what theme is used on their site. They just want it to work day in and day out. Builder has delivered that for me and given me peace of mind. For me, that is huge! 2012 was also a great year for Builder. I was the year that Builder 4.0 Responsive was released. I do not have to tell you how important a solid mobile strategy based on responsive design is on today’s Web. Builder 4.0 added responsive features in a way that is both very flexible, works great out of the box and does not break existing sites. It’s the kind of revolutionary upgrade that often means a clear break with the past and difficulty upgrading existing sites. But unlike Headway and their upgrade from 2.0 to 3.0 or Thesis with their upgrade from 1.x to 2.x, the Builder 4.0 upgrade was painless. Chris Jean which is Builder’s lead developer at iThemes is someone I truly admire because of his level headed customer-oriented approach to theme development. When you upgraded a Builder 3.x site to 4.0, you needed to add a line of code to your child theme’s functions.php to activate the responsive features. Otherwise, your site was basically unaffected and the layout didn’t change. Again, priceless. I love this approach to theme development because it instills confidence and you know you can upgrade your parent theme with no fuss or worries and benefit from any security or performance improvements even if you are not ready to use a new feature as big as responsive right away. Updating child themes is not as easy as updating the parent and Builder’s stability gave me time to figure out how to do it before I tackled it on client sites. This upgrade to Builder 4.0 also brought updates to several child themes. The one that interested me most is Builder Default as it is the base child theme I’ve used to build all my Builder based client sites so far. The way I’ve worked with it has evolved recently mostly because of my experience creating child themes for WooThemes Canvas. The two frameworks use a different strategy for styling their child themes but the way Canvas does it has pushed me to modify how I do it with Builder. What I mean is that, when creating a child theme for Canvas, you generally just import the parent theme’s style.css into your child theme’s style.css and either add your own style in that file or use another file named custom.css in your child theme that Canvas loads automatically if it is present (you don’t need to enqueue it yourself). This means that if a parent theme update significantly changes the layout CSS, it’s possible that a site’s layout could break. On the other hand, when you use the Builder Default or any other Builder child theme, the child theme’s style.css file contains all the styles that affect the look of the site (other than built-in framework styles managed by the parent theme exclusively). The style.css file in Builder child themes does not import the parent’s version first then add style overrides to it. They are a complete replacement so the parent’s style.css is not used at all. In order to add your own customizations to CSS in Builder child themes, you generally either edit CSS rules directly in style.css or add new rules at the bottom of that file to either override default styles or add new ones. The later method is what iThemes generally recommends. But in my own Builder child themes development workflow, I usually went with the first method and modified style rules directly. Old habits die hard and it felt “wasteful” to me to just repeat the same style rules with different values instead of editing the original ones directly. Since Builder child themes do not import or rely on the parent’s style.css at all, it made sense to me to do it that way. I’ve been working on the Web for a long time now, and until not that long ago, the idea of keeping all files as small as possible was still a very important issue that was constantly being drilled into us. But the size of a CSS file these days is not as critical as it used to be. I’m now realizing that this method of customizing a child theme is far from ideal… Live and learn! What is becoming more important for me is making it easier to update child themes. These updates are definitely not as frequent or critical as parent theme updates but, in the case of Builder 4.0 and responsive for example, a lot had changed in the responsive child themes’ CSS. As I had modified some but not all the rules in there without just adding override rules to the bottom of the file, I could not just overwrite the old style.css file completely with the new one and it made updating my child themes more difficult than it needs to be. This point is moot when a child theme just imports the parent styles like Canvas but Builder’s method is great because it’s one of the reasons updating the Builder parent never breaks a site layout. So, with time I developed an hybrid strategy in my Builder child themes that is influenced by how Canvas and other themes work. I now create a custom.css file in my child theme and enqueue it in the child theme’s functions,php file. That custom.css file is where I put all of my styles whether they override the child theme’s existing styles or add new ones. This means that the child theme’s style.css file remains untouched and, as my styles are added to my own custom.css file, they are also loaded much later in the head code which makes it easier to override theme and plugins styles without relying on !important. This will make child theme updates much easier too because my additional styles and overrides are segregated in a separate file. The other major evolution in my Builder child theming workflow is that, on my latest project, I’ve used their new Air starter child theme instead of Builder Default as I always have before. Air is a great starter child theme that has support for many post formats and adds several cool features over the plainer and simpler Builder Default. As I said above, sometime during the last year, I started trying other theme frameworks. I didn’ t do this because I was unhappy with Builder, quite the opposite, I just wanted to have at least one solid alternative I could depend on. I didn’t want to put myself in the same position I was in when Headway stopped delivering the results I expected and I had to frantically search for an alternative while on a project deadline. I doubt that iThemes will ever make Builder unsuitable for my needs but you never know what may happen down the road. A company can disappear or a product can change in ways that do not serve your own specific requirements anymore for whatever reasons. That’s life in the software industry and we have to be prepared to face such situations. I evaluated several framework over the last 3 years. I had no intention of going back to Thesis (ever) or Headway (for now) so I looked at WooThemes Canvas, Genesis (with the Dynamik child theme) and Catalyst. I now own all 3. Genesis and Catalyst are solid frameworks in their own right but the one that fit my workflow and philosophy best was Canvas. The WooFramework behind it is akin to Builder in that it uses the standard WordPress templates hierarchy and you can edit loop code directly. I explained why I much preferred this over non-standard implementations in last year’s post and this is one of the main reasons I chose Canvas. I also own a few other Woo themes including one of their “application” themes named SupportPress which is awesome as well. Another reason I settled on Woo and Canvas is that I started using WooCommerce and several of their plugins and developed a healthy respect for WooThemes as a company because they offer very high quality products and support them well. Canvas works great with WooCommerce out of the box. Finally, Canvas is a very full featured theme that clients love and it offers a lot of built-in functionality like sliders, a few special custom post types (portfolio, testimonials/feedback, etc) and more. It’s also an “options” based theme which means that you can tweak a lot of design parameters directly in the WordPress admin (colors, layout, typography) which can save significant time. Canvas is a fun theme to use and work with. It’s not as totally flexible as Builder in terms of layouts but it’s very easy to style and has a lot of hooks. I could use either one exclusively and deliver quality sites to my clients. Canvas is rapidly evolving and already is a powerful, well supported product. It is WooThemes’ flagship theme after all. Now why would I choose one of Builder or Canvas over the other on a specific project depends on several criteria. 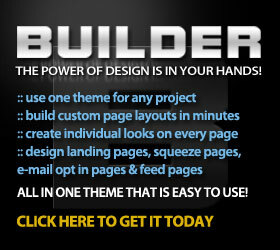 If I need total layout flexibility and I know a project will be technically challenging, I’ll probably choose Builder. For a quicker turnaround, simpler layouts or if I need to use WooCommerce, I’ll probably use Canvas. But the choice is not always this obvious and I’m still working out the process. This post sets the table for more in-depth looks at these theme frameworks and how they can help you build complex WordPress sites for yourself or your clients. I’ll be writing reviews of both Builder and Canvas soon. But my next post will be similar to this one but about plugins. In the last 3 years I’ve come to rely on a few trusted plugins I use on every projects and others that fill specialized needs. This is another area where information may be confusing or conflicting so I’ll try to direct you to some of my best finds and why I think they are worthwhile additions to anyone’s WordPress toolset. Thank you very much for reading and, as always, all your comments and questions are welcome! I feel like you are like my long lost twin brother as they show in the movies. I have exactly the same feelings about the themes you mentioned. Headway – The last time I checked you can’t set a custom width for your layouts (Ex. 1234px). A post in the forum where others asked the same was replied with “this is not possible” and promptly closed. I did not try it again. Genesis – So I wanted to make a change in single post page, open up single.php and what do I see? “genesis();”. I say “Get lost” (to put it mildly). Show me the loop baby! WooThemes Canvas: Feature rich out of the box, lot of things that can be changed in the backend, full loop code in template files. It’s what I hoped Genesis would be. Headway – I haven’t dug into the latest releases but indeed, I don’t think you can set a specific width yet because of their grid thing but don’t quote me on this. Genesis – the lack of standard loop code to tweak is indeed an issue for me too but the framework is far more stable than Headway that I have seen. Their popularity is certainly not undeserved and, unlike the Thesis guy, they have respect for the WordPress ecosystem and community. Their support and documentation is top notch too. But I’ve never used it on a real project yet. As for Canvas, there is a lot to love there too. Glad to know you like them too. To a point Genesis can be tweaked somewhat similarly with the Dynamik child theme created by the Catalyst folks. But I’m kind of a little scared of a framework that 100% depends on options saved in the database. I can’t say it doesn’t work well though and it seemed quite reliable in my testing. Dynamik is certainly full featured child theme and Genesis has a ton of hooks to leverage. Thanks for your comment and RT on Twitter. Much appreciated my friend! Adding a quick reply to my own comment to correct a statement I made. Dynamik saves both its CSS and any PHP functions you add to its Custom section to files (minified CSS file and to functions.php) so the front end display is based on real physical files and not options in the database. Dinamik is VERY well architected and efficient and I now love it more and more. Great post. I don’t use builder but have been thinking buying builder. I belong to webdesign.com that Corey Miller runs and I think they are tops. I do own canvas and catalyst and love canvas. I’m still trying to work with catalyst but don’t love it but am trying to get there. I agree with you that there are lots of reviews online but everyone seems to be an affiliate marketer and getting trusted information is very hard. Thanks for your honest review. It was very helpful for me. I knew there was a reason I was pushed to use Canvas and like you I wanted to be familiar with several frameworks so I don’t get left out if one goes bust. One more thing, Seems like everyone and their mom is in love with Genesis. Am I missing anything? Do I need to get on the Genesis bandwagon? Also do you still recomment just getting the basic builder and not their entire package? Hi Summer, thank you very much for your comment! iThemes are indeed tops and Builder is a very solid framework. Stable, extremely flexible (especially if you can code) and the support is amazing. As for what package to get, I have the Dev Pack myself which is their mid priced tier. It comes with LoopBuddy which is worth the price difference in itself and BoomBar which is a nice plugin but I prefer FooPlugin’s FooBar Pro which is a lot more flexible. I’m not interested in iThemes’ classic premade themes (included in their the All Access Pass option) as I use frameworks as starting points to integrate custom designs for almost every project. I also think the design of their child themes is iThemes weakness although 3 of the last 5 seem way better (Noise, Air and Everett). In general I find the design of their child themes to be quite ordinary and uninspiring. WooThemes is far better in that regard, one of the best of any WordPress theme vendors in the WordPress ecosystem IMO. As for Genesis, I understand why it is popular. It’s a fantastic framework. Like iThemes, they are very prudent in their upgrades and no upgrade of the parent theme should break a site. Genesis 2.0 which will be released soon moves to HTML5 but, like Builder 4.0 and Responsive, you need to activate that explicitely in the child theme. If not, it will output its traditional XMTML markup. No “scorched earth” break with the past upgrades that leave their customers hanging like Headway 3 and Thesis 2. I truly respect that. Their support is also awesome. I’m also relaxing my stance on the need to build a framework using the standard WordPress templates hierarchy. My experiences with Headway that led to my ditching it made me overly reluctant to use a theme that is built differently. But Genesis and Catalyst both do it right. Tons of hooks, extensive documentation and turorials (especially for Genesis) and they will do what’s needed to make their framework work with other popular WordPress products like the Genesis connector plugin for WooCommerce. Genesis has very good front end markup too and that is a huge reason many a-lister bloggers use it. It’s great for SEO, especially since it will also support and output microdata which Google loves. For a “Canvas-like” experience, the Dynamik child theme for both Catalyst and Genesis is really poewrful and flexible and has even more options than Canvas. Catalyst also makes an Extender plugin for Genesis that brings many of the Dynamik features to Genesis while still using their base/sample child theme or any of their pre-designed child themes. I’m (slowly) working on a redesign of my business site (not this one) and I’ll probably put it on Genesis (it’s on Canvas now like this site). I want to get real world experience with it so I can add it to my arsenal with confidence. Many clients who know what WordPress is have heard of Genesis so I want to be able to give it to them if it’s appropriate for their project. We’re lucky in that we have very solid choices now and I’m happy I invested in Builder, WooThemes, Catalyst and Genesis. I can really choose the best fit for each project now although my main go-to framework remains Builder. I’m wavering between Canvas and Genesis – specifically the Dynamik child theme. Do you have any further feedback on which is the way to go? I’m at a point where I want more control over my site design and I’m not a coder. It seems as if a lot of sites say that Genesis is a better framework than WooThemes. Any further feedback as to which framework to go with? I already own Canvas, but I’ve never actually used it and I also own Genesis and another Child theme. I know enough to know that for the user who isn’t a professional developer, it’s best to choose one framework and stick with it because otherwise, there is too much time to invest in learning. I want a site that gives me a lot of choices for design but that is also a great performing framework for speed and SEO. It is for a photography oriented site – I’ll probably be installing something like foobox for the slides, though. Thanks for any insights. Thanks for your comment. Like I’ve said before, which framework to choose really depends on what type of user you are now and if you are willing to learn a little coding in the furure (basic CSS, a little HTML, nothing very complicated). Without at least a basic CSS knowledge, you will run into the limitations of the options provided by the theme eventually. None of them are built for all use cases and none of them will get you 100% there on all projects without a little bit of code. Don’t believe anyone’s hype in that regard. With that said, I’d usually say that, Canvas would be more suited to a non-coder than Genesis but Dynamik changes everything. It has a lot more no-coding options than Canvas does. If you want to use premade child themes then also look into the Genesis Extender plugin from the same folks that make the Dynamik Web Site Builder child theme. Genesis 2.0 soon to be released also changes things as it adds Schema.org markup which will help in search engines. That is a slight advantage over Canvas as both output HTML 5 already. As for which is better objectively, that’s very hard to say. Genesis is more popular but WooThemes is a larger company. Both themes are architected very differently with Canvas using a more standard approach using traditional WordPress template hierarchy and Genesis is more hook based. Out of the box, Genesis is more geared towards developers, especially if you plan on doing 100% custom layouts and not use their predesigned child themes. But again, Dynamik is what makes the real difference. As you already own Canvas, I’d say install a couple of test sites, get Genesis and Dynamik (the makers of Dynamik have specials now including a coupon for Genesis) and try both. Myself I am far more familiar with Canvas but am tinkering with Genesis on test sites and plan to use it for the new version of my biz site. Play with both, see how you like them! I still care about lightweight, clean and readable HTML and CSS. I don’t see myself ever giving in to the philosophy of throwing sloppy code together because file sizes are no longer an issue. I’m a front-end developer who cares about my code, and it pains me to have to do certain things just to get a theme to do what I want it to do. I build heavily customized WordPress sites. I snagged the Canvas theme because we’re going to use WooCommerce on a new site we’re developing and I thought it’d be a good base theme to build on for that and possibly use it on all future sites if it turned out to be good. While in some ways it’s better than many of the other themes I’ve used (including Genesis-based themes, and several from ThemeForest which we use for lower-budget clients), so far, I’m not liking several things about it. I have no need for any advanced no-code options in the WordPress admin panel to customize styles, I’m perfectly competent doing that myself in the CSS. Yet, even if you don’t use the Canvas options panel, it still throws tons of inline styles into the HTML and I absolutely hate that! There’s not even an option to turn off borders. You have to set them to a thickness of 0px, but the full CSS border style is still generated (e.g. border: 0px solid #FFFFFF). I know there’s a way to turn off the inline styles though, so I’m not too concerned, but why can’t a theme just generate the options-driven custom CSS on the fly and combine all CSS (static and dynamically generated styles) into one dynamically generated and size-optimized CSS file, rather than linking to each and every CSS stylesheet? Also, when I create a child theme based on Canvas, there appears to be no way to override the ./css/layout.css file or other CSS files contained in the ./css/ directory. I shouldn’t have to override them, but there’s always the possibility of needing to. In the case of layout.css, however, I do need to override it. The main issue, there, is the styling of the navigation. I shouldn’t have to undo all the backgrounds and borders and font colors, each style property of which seems to be haphazardly sprinkled randomly in either the styles.css or layout.css rather than simply being put all in one place, preferably into the custom.css where I can simply wipe those styles out with my own custom.css file that would take the parent’s place in my child theme (and thankfully that file does override successfully), or simply copy the parent custom.css and modify in my child theme’s custom.css, taking care of all the custom style rules all in one spot. Don’t make me do extra work and add unnecessary overhead to my code simply to undo those styles before I do mine. I shouldn’t have to add extra unnecessary code to my theme by having to write border: none; background: none; text-decoration: none; etc for every single element, pseudo element and sub-rule that I need to remove styles from, from the parent theme, before I can code my own styles unobtrusively. In my mind, for a base theme to work well as something to build off of, the CSS that dictates layout should be separate from the CSS that dictates style itself, like borders, backgrounds, colors, text-styles etc. I repeat, you should never have to write additional code that undoes other code, before writing code to do what you actually want to do with it. I also don’t like how it puts a 3em margin below the nav. I prefer to use padding in the #content or #main div so that I can style that section separately without there being a 3em gap between the nav and the styled content section. My final complaint (so far, and after only a week using it) is about the lack of a decent grid system. Canvas hasn’t leveraged the power of a grid system yet. Though some might say that such an addition is unnecessary overhead/bloat, there is definitely a convenience factor if you use a lot of columnar layouts on various sections of the site. Furthermore, the Canvas PSD (which was an absolute waste in its own right, because it didn’t have the ecommerce content in it) included a 16-column grid in it, giving the impression that Canvas is supposed to have a grid system. While digging through the style.css file, I noticed that in the Table of Contents, there’s supposed to be a Section “7. LAYOUTS” which is supposed to include at least styles for a primitive grid system with two-column and three-column grid options, but when you get to that section you’ll see that it skips right from Section “6. MISC” to Section “8. TEMPLATES/SLIDER”. I don’t see those primitive grid system column styles in the layouts.css file either, at least not for use anywhere on the site. I know I could pretty easily pick a grid system on my own and incorporate it into Canvas, but I don’t want to have to do that. Granted, I haven’t tried iThemes Builder yet, and maybe I will. I noticed they’re working on their own little ecommerce plugin suite. Good for them. I just wanted to vent my frustration with Canvas to someone who seems pretty like-minded, perhaps evoke a response from other users, and hope maybe WooThemes will see that there’s room improve their Canvas theme and does so at some point. Canvas is okay, and maybe I just have high standards for coding, but in my eyes Canvas isn’t all pretty rainbows and pots o’ gold… yet! Sorry for taking this long to approve your comment, I’ve been absolutely swamped with work in the last few weeks. I absolutely hear what you are saying about Canvas. I’m starting to come to the same conclusions. It and other Woo themes have a lot of styling overhead and overriding some of these styles is often way harder than it should be. Especially for navigation, you are spot on about that. But Canvas is evolving and WooThemes seem to be listening to their customers. On the other hand, Canvas 5.5 is proving a very disruptive update for me and forces me to fix the styling of some sites. That always bothers me quite a bit. On the other hand, I’ve progressed with my own site redesign based on Genesis and the Dynamik child theme and I’m even more enthusiastic about that than I was back in July. Further, I am finishing a client site based on Genesis and just the base “sample” child theme that comes with it and that reproduces the parent theme’s design out of the box. I have to say I found its CSS very elegant and easy to modify. Much more so than with either Canvas or Builder. The markup is also very efficient and lean, a marked improvement over Builder in that regard. If you prefer writing all your own CSS, that would be something I’d explorer in your case. My respect for Genesis is growing by the day. As for CobaltApps’ Dynamik child theme for Genesis, yes it has a lot of no-coding options but for me they are the right kind of options done the right way and you don’t need to fight with the built-in structural CSS as with Canvas. It’s just a means of getting to a good baseline of your design faster. And the CSS is saved to a file and minified after saving the options. On the front end it’s very lean although I need to explore it more. I have little time for deep investigation these days. Genesis on its own or the Genesis/Dynamik combo could take a larger role in my workflow going forward. Community resources are fantastic, especially for Genesis itself of course but also Dynamik and Gensis Extender. CobaltApps’ Eric Hamm is one smart dude that listens to his users. Like the iThemes guys, I like the rational development philosophy of the StudioPress folks. An update as major as 1.9.2 to 2.0 broke nothing on client sites. For me that is huge. The CSS and markup are well thought out. These guys really sweat the details. So I’m going to spend time learning how to work better with Genesis even if its hook based workflow bothered me at first. I’m realizing that it’s an efficient system. iThemes are making some interesting moves with LESS and using core WordPress features to modify things like header images and such in one of their Builder based themes. I’m finding that Woo sometimes have an over reliance on their own functions instead of using native WordPress functions (for images display for example). That’s sarting to annoy me. Genesis and Builder are much better at using core tools to do basic things. That is starting to come into play in my framework decisions for new projects too. If you would be in the beginning with creating websites and don’t know too much about css and php what solution would you choose to layout,design the websites? This is hard for me to say at this time. I would have to know if you’ll be doing those web sites for yourself only or for paying clients. If it’s for custom designs for other people starting with small projects and you are willing to learn even if you don’t know much now, I’d say, go with Genesis and the Dynamik Web Site Builder. When purchasing Genesis, I’d go with the Pro pack if you have the budget. That way you can tweak existing solid designs as you learn. Then the Genesis Extender plugin from CobaltApps (who make the aforementioned Dynamik child theme) would be helpful. Both Dynamic and Extender have CSS and PHP builder tools that can help your learning curve. In any case, with Genesis you would be using the best framework (IMO) and its community is truly awesome. All these (Genesis/Dynamik/Extender) are one time payment and unlimited everything. My second choice for you would be iThemes Builder or WooThemes Canvas. If you are on a budget, iThemes would probably be cheaper. Both iThemes and WooThemes have great support and good communities too. If you just want to do web sites for yourself or friends without making this a career. My advice wouldn’t change much and I would still recommend choosing one of the 3 theme vendors above but go with whatever theme or child theme looks closest to what you want. But if you want to do custom designs, my Genesis/Dynamic/Extender recommendation stands. I was referred to your post by Sridhar Katakam (http://www.sridharkatakam.com). The two of you have been very helpful in providing in-depth information on Builder and Genesis. As I mentioned to Sridhar, I need to update my sites to be more professional looking in appearance, as well as reliable (no breaks and weird things happening) when there are wordpress updates and theme updates. I currently have problems with one of my site’s current themes. So not only do I want to change the themes on my own sites, I also want to create professional-looking sites for others. I have been struggling to decide between Builder and Genesis, but the answer you gave Adrian likely also applies to me. What I want to know is what would be better if I may need to create different-looking websites for various clients? i.e. would Dynamik along with Genesis be best, or would the child themes in conjunction with the extender plugin be the better option? I am not a coder, and cannot possibly learn all of the Genesis child themes, which is why I’m confused as to what to do. Thanks for your help! From your comment, my reply to Adrian definitely stands for you too except I’d put even more emphasis on choosing Genesis. Beyond that, it depends on your budget. You do not need to “learn all Genesis child themes”. Learning some CSS and HTML at minimum and eventually some PHP would give you skills you can apply to any theme or child theme. For now, if you want the most flexible option to do your own designs with minimal code tweaks or none at all then the Genesis/Dynamik option would probably be best. If you find a child theme in StudioPress’ catalog that’s close to what you’d want then that child theme and Extender would work. At the end of the day, tools are just that, tools. They will never replace skills. Good luck and don’t hesitate to ask further questions! Look at Sridhar’s tutorials. He is doing absolutely amazing work for the Genesis community. I really do not know how he finds the time but his site is a treasure trove of usable information for Genesis users. Take advantage of it before he decides to put it all behind a pay wall! 🙂 Go on Twitter and look at my WordPress and Genesis lists. Follow everyone on them and learn! Thank you for your usefull posts. I come from joomla with gantry from Rockettheme and want to try something else, so I now get started with WordPress. Do you think that one of those themes will be an good alternative to Genesis + Extender + Dynamik, or the Itheme-Builder? I am still in the process of choosing which solution to start and to stick with. Hello Hanin, thanks for your comment! Whether you use Dynamik or not, I’d still recommend Genesis. I would also very strongly recommend you stay off ThemeForest completely. Although there are some good theme authors there, the general quality of the themes there is abysmal. They have a horrible and well earned reputation in the WordPress developer community. They are trying to improve but I’d still avoid them. Most of their themes add way too much features that should be in plugins. Anything that relates to content should be in plugins, not themes as changing theme means you “loose” that content (it’s still in the database but just disappeared from the admin and public part of the site). Both Genesis and Dynamik are pay once and get support and updates for life. Play with them in a local dev server and see how you like them. Genesis has probably the largest and best community. StudioPress also has the best documentation I’ve seen for their theme. I use it exclusively now. Dynamik will also soon get a significant update with features users have often requested. Try them out, it’s a sound investment IMO.